Mix flour and salt. Cut in Crisco. Add water a tablespoon at a time till crust is soft and pliable. Roll out into 9 inch circle. Place in glass pie plate and flute edges with fingertips. Prick crust with a fork and bake in 325 degree oven till golden brown. Beat egg whites with vinegar and salt till stiff. Gradually add ½ cup sugar and beat until very stiff. Spread meringue over bottom and sides of baked pie crust. Bake at 325 degrees until golden brown. Cool completely. Melt semisweet chocolate bits. Blend in the 2 egg yolks and water. Spread 3 TBL of this mixture over the cooled meringue. Chill until thick the remainder of the chocolate mixture. Beat the whipping cream with the ¼ cup sugar. Spread exactly ½ of this mixture over the meringue and chocolate topping. Put in refrigerator to set. Mix the remaining whipped cream with the remaining cooled chocolate. 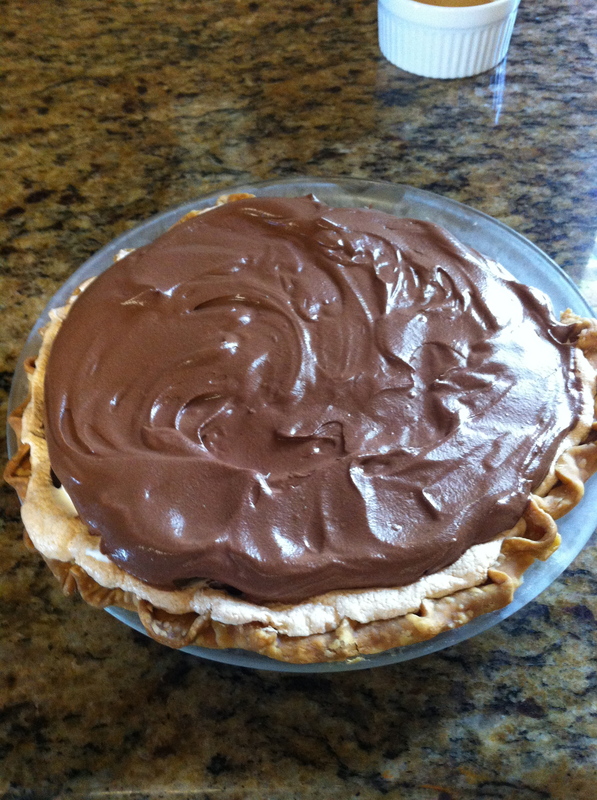 Spread this chocolate whipped cream on top of the regular whipped cream on the pie. Take shavings from the dark chocolate bar and sprinkle on top. Keep refrigerated. You are currently viewing the archives for October, 2010 at Michelle Conaway.